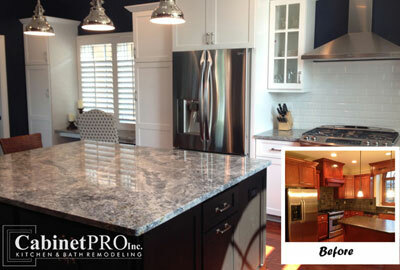 Cabinet PRO is Chicago's leading cabinet refacing contractor. We can breathe new life into your existing kitchen cabinets. If you like the basic layout of your kitchen and the cabinet frames look like they're in pretty good shape but you want an updated look, cabinet refacing is your answer. Choose a door style and color, and in a matter of days, your kitchen cabinets will look brand new. Get the kitchen you've always dreamed of - and save money! 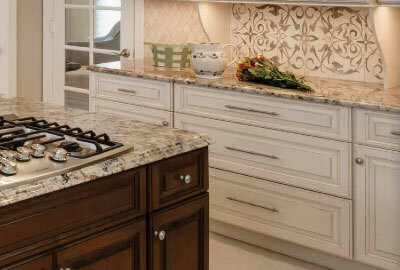 Cabinet refacing can save you approximately 40% to 60% over the cost of new cabinets. We can even mix new cabinetry with your existing cabinets for additional space and updated layouts. There are seemingly unlimited choices when it comes to cabinet refacing doors. We offer more than 200 different cabinet door styles and over 90 different standard finishes. All of our cabinet doors are made to your specifications in size, style, profile, wood type and finish. With optional accessories, such as custom wine racks, appliance panels, and glass panel cabinet doors matched to your wood, style and finish, you can achieve dramatic results - and at significantly less costs than purchasing new cabinets. Our extensive selection of premium solid wood cabinet doors includes maple, oak, hickory, cherry and knotty pine. We also offer cabinet doors with accent glazes, antiquing, distressing and speckling - turning ordinary wood into cabinetry with a beautiful, furniture quality finish. We use only top quality wood for our cabinet doors and each door is selected for uniform color and graining. Download the pdf file to view cabinet door styles and colors or visit our showroom to see samples of our quality cabinet doors and finishes. Our thermofoil doors are available in over 20 colors. Additionally, we are one of the few cabinet refacing companies offering painted cabinet door finishes. Consider everything that's currently in your kitchen. Are all baking pans stored together? Are your most frequently used cooking tools in the most convenient places? 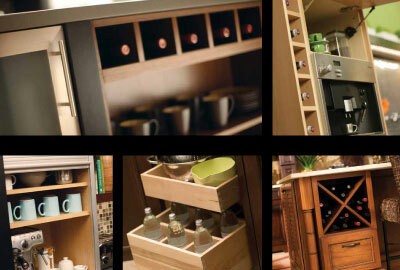 If the answers to any of these questions is "no", your cabinets may benefit from an organizational overhaul! By planning where all items will be stored in your kitchen cabinets, you will have a better understanding of your storage dilemmas and also the products available to solve your organizational needs. Pullout filler cabinets can maximize space that would otherwise be wasted. 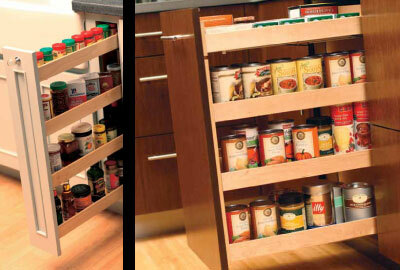 Spices, baking sheets, and canned goods are all options for a filler cabinet pullout. 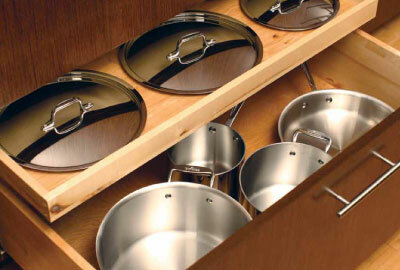 Adding pullout drawers to your base cabinets makes retrieving pots and pans a breeze, even in back corners. Recycling is easy to manage with our handy pullout recycling center. 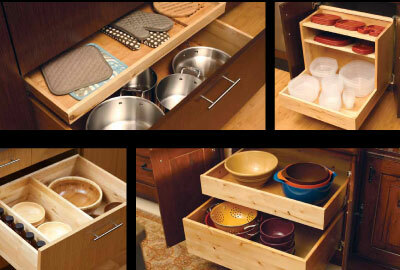 Other popular storage solutions include Lazy Susan shelving, "half-moon" racks to take advantage of corner space, vertical slots for trays and baking sheets, pantry organizers that can include pull-out drawers or pull-out wire baskets, spice drawer organizers, appliance garages, open bookshelves to keep cook books handy, and a variety of built-in wine racks. 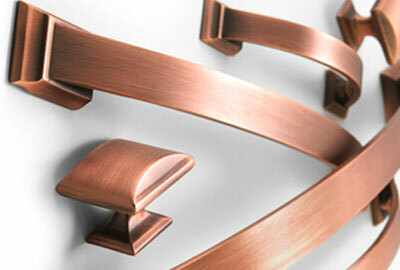 Häfele offers more than 3,500 cabinet knobs, handles and pulls in a variety of sizes, styles and finishes. Available in stainless steel, brushed, nickel, antique brass, pewter, oil rubbed bronze, matt, polished, and chrome finishes. Style selection includes: modern, traditional, arts & crafts, funky and more. Amerock is continuously introducing new designs, colors and finishes based on surveys of decorating trends and consumer preferences. Amerock brings fresh, lasting looks to appeal to a wide variety of tastes. We've compiled a list of questions most frequently asked by our refacing customers below. Click through the toggles below for cabinet refacing questions and answers and call us with any additional questions or for a FREE in-home price quote. What is the cabinet refacing process - what's involved? First you select new cabinet doors from our wide variety of styles and finishes. Then, we get to work! Our methods have been proven over the years and have set us apart from our competitors. We begin by removing and discarding your old cabinet doors and hinges. Then we strengthen and repair cabinet frames where needed. The next step is to carefully prepare the exposed frames to ensure a solid bonding. This may include sanding the frames. Next, we laminate all exposed frames with a matching wood or laminate, depending on the door material you've selected. Our special two-part bonding system includes the use of a special manufacturer-recommended glue, which, when applied to both panel and frame, ensures a unique bond. Finally, we conclude with the installation of your new cabinet doors, drawer fronts and hardware. How long does it take for cabinet refacing? How inconvenient is it? Depending on the size of the job, we can reface your cabinets, on average, in 3 to 5 days. Since we do not tear out frames, the mess is kept to a minimum. 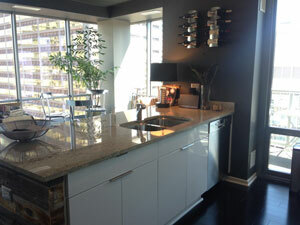 Our installers clean up every evening to allow you the use of your kitchen throughout the process. What's the cost of cabinet refacing and how is it different than purchasing new cabinets? 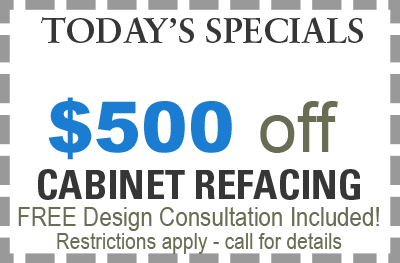 Because we use your existing cabinet framework, usually a 40% - 60% savings can be achieved with cabinet refacing. We tell you up front what your total cost will be. We don't give you estimates. We give firm prices. We'll also give you new cabinet pricing, so you can compare and make an informed decision. I may want to add or remove some cabinets in my kitchen. Do you do that? Yes. We can build additional cabinets and even add new drawers to your base cabinets. 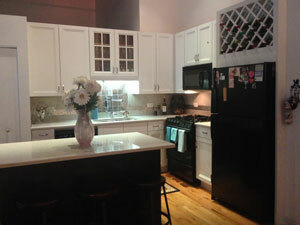 We can also take out or cut down your existing cabinets to fit new appliances. We can provide rollouts, lazy Susans, new shelving and trim. New custom islands are our specialty. 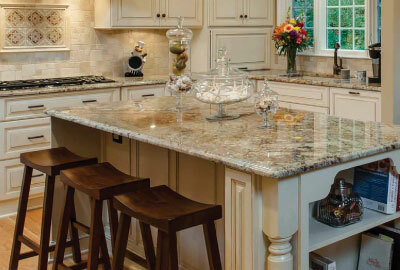 What is your cabinet refacing warranty? All of our doors are warranteed by the manufacturer. Our refacing work is warranteed for 10 years. Relax! You're covered with the Cabinet PRO guarantee! 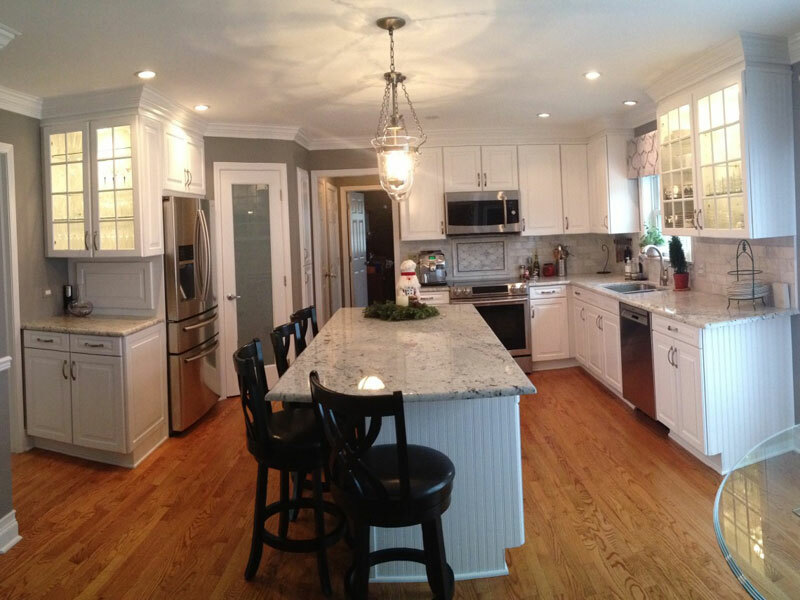 A cabinet refacing project doesn't have to stop with just replacing the cabinet doors. Browse through our refacing ideas section to see some of the possibilities. Then visit our showroom or schedule a FREE in-home estimate by using the form at the top of this page. We're here to help! We know how stressful remodeling can be - from selecting the right product, to getting the best price, to signing up the right contractor. Our process is both effective and efficient, saving our customers time and money. We do hundreds of projects every year. 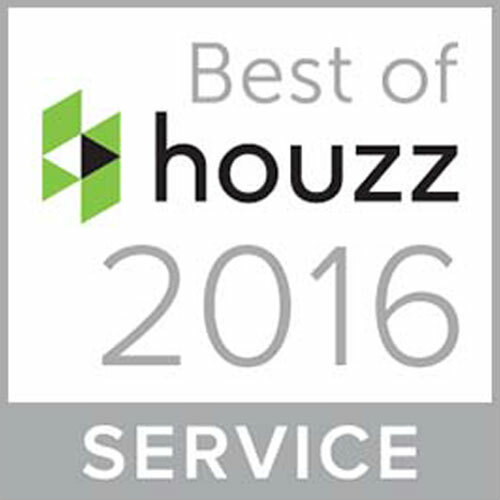 With over 25 years of experience, our methods are well proven and set us apart from our competitors. We're confident that you won't find a better price for the same workmanship and materials. The process begins by meeting with you in your home to understand your needs and provide you with ideas and advice about your project. Our talented designers will make suggestions for changes that you might not otherwise think of that could enhance your project and give you more satisfactory results. We bring samples to your home so you can see the colors and styles in your home before making your decision. Once you've met with our designers, we will take your ideas back to our office and create a design that fits your lifestyle and needs, staying within your specified budget. We provide you with expert assistance in designing your floorplan so that you will have a good idea of how your refaced cabinets could look. If you're doing a full remodeling project, your design could include ideas for cabinetry, flooring, tiling, lighting, countertops, sinks and fixtures. When the design is complete, we'll meet with you to answer any questions you might have and make modifications where necessary. We will assist you in making all of your selections from cabinetry to countertops, flooring and lighting, and everything in-between. It's your choice to purchase any of the materials independently, or to have us order them for you. We install everything you will need to complete your job. While this may seem a daunting task with so many different options from which to choose, you'll be surprised at how easy the selection process can be with the help of our talented design staff. After you make your final selections, a contract is signed and we order the materials. Our 2000 square foot showroom adjoins our manufacturing facilities, allowing us to complete your project more efficiently. By shipping materials to our warehouse, we're ready when we begin your job, equipped with everything we need to complete your project as efficiently and with as little disruption to you as possible. When all materials are assembled, we schedule your installation at a time that's most convenient for you. 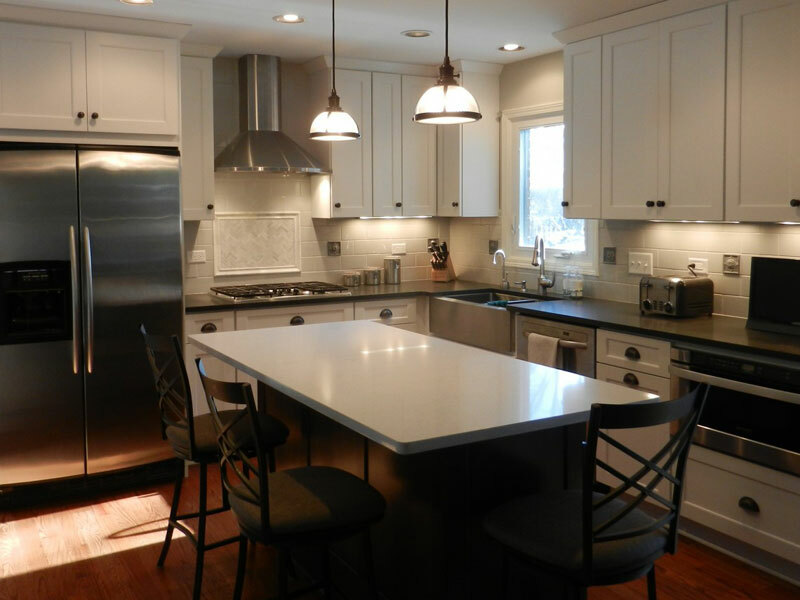 We handle and coordinate all aspects of the installation, including the cabinetry, countertop, flooring, plumbing and electrical. We are experts at installation and are fully licensed, bonded and insured. Our project management skills are among the best in the industry and we complete our projects with as minimal disruption to our clients as possible. Cabinet PRO sells only the best quality products in the industry - many of which come with their own product / material guarantees. Because we supervise and control the quality of the work manufactured by our fabricators and installers, we are confident that you will be completely satisfied with your selected products. We're not finished until you're satisfied! If something is not quite right, we'll fix it! Turn wasted filler space into clever storage solutions. Ask us how! Get Organized - Ask us How! Relax! With Cabinet PRO, you're covered! We guarantee satisfaction!